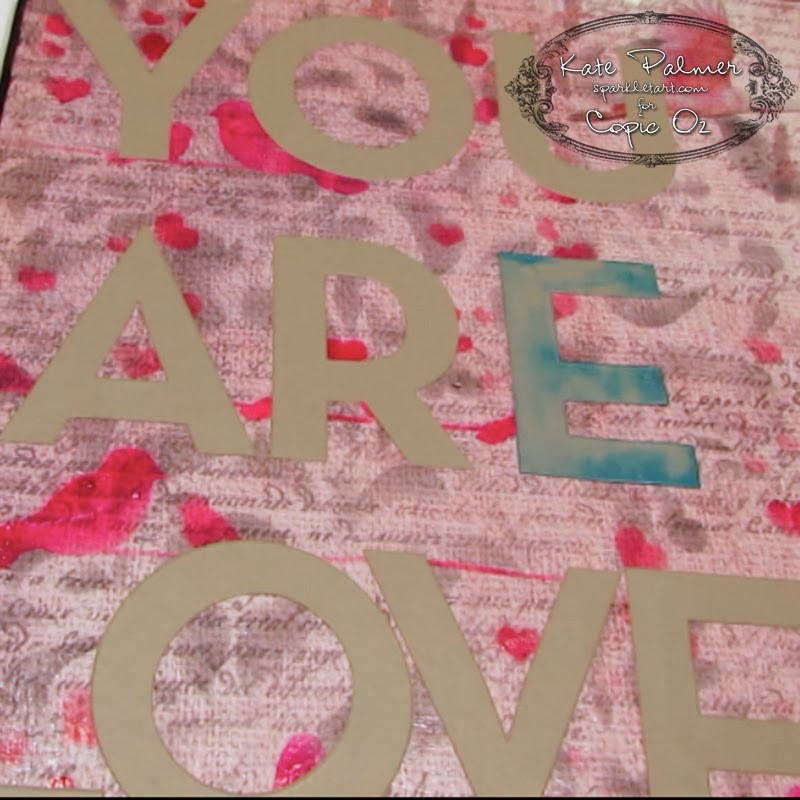 Coat the canvas with Triple Tac and glue the Fab Scraps paper to the canvas - remove any air bubbles and allow to dry. 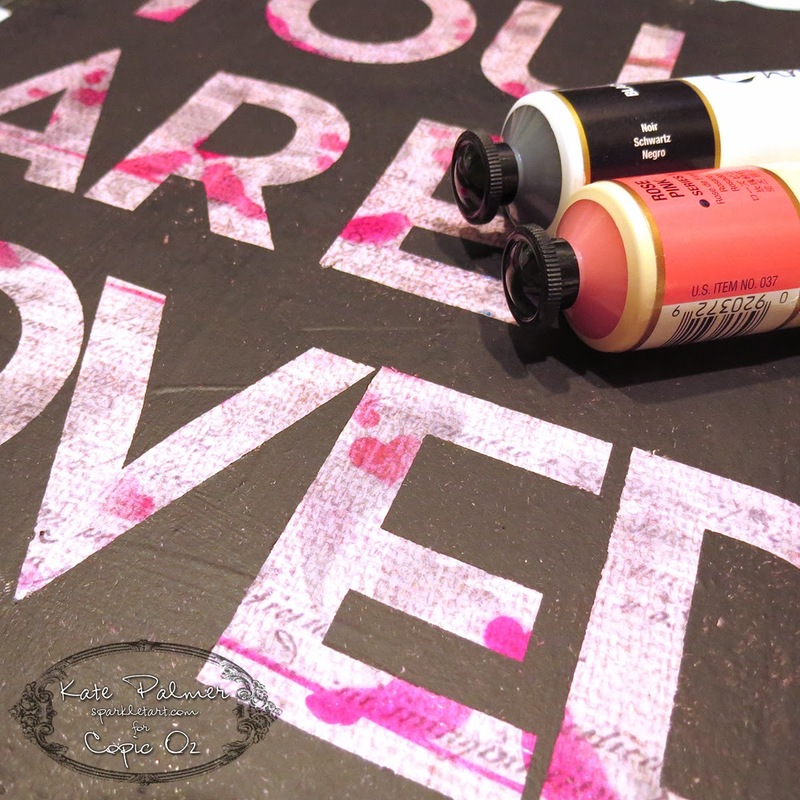 Once dry add another layer of Triple Tac over the surface of the paper to act as a protective coating (this makes sure the letters don't stick or lift the paper) - leave for 3-5 hours to completely dry. 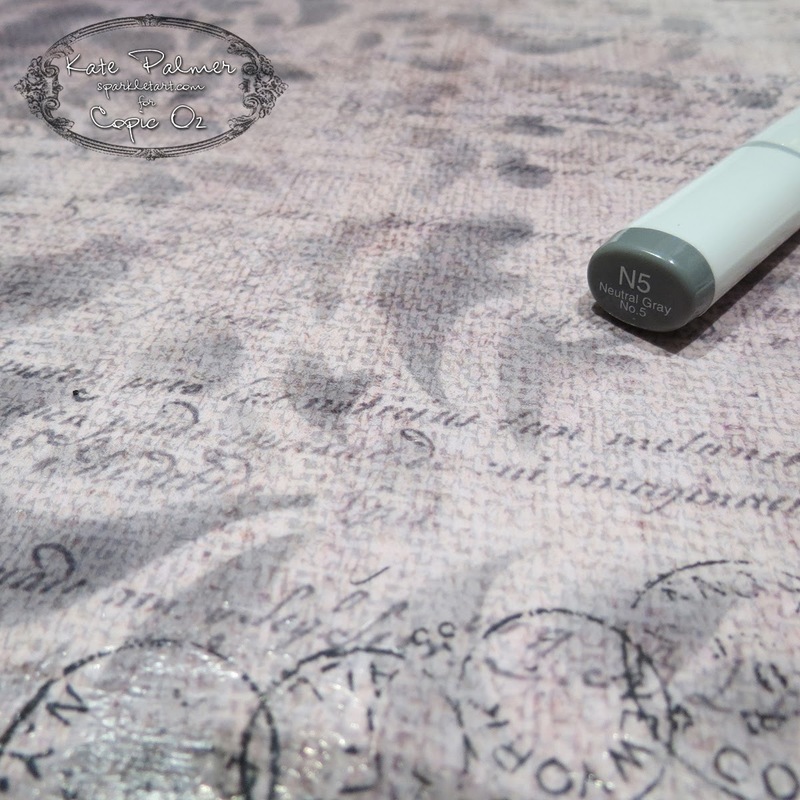 Using Copic Sketch marker N5, stencils and an airbrush, add a pale grey design across the patterned paper. N5 is my favourite grey as it looks great with both cool and warm colours and it isn't too dark! 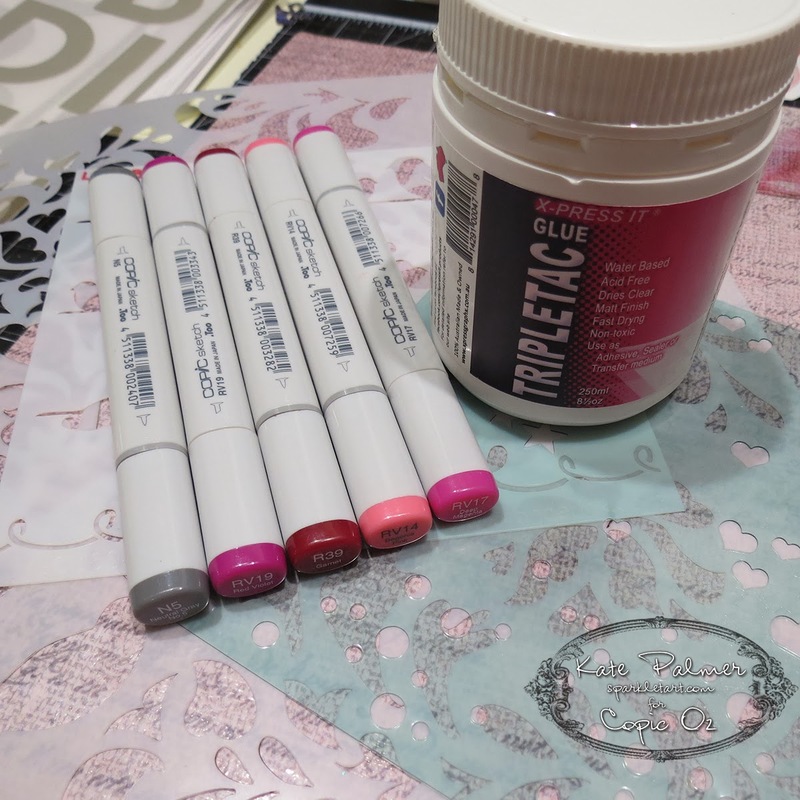 Using a variety of bright Copic markers and stencils, add designs across the paper. 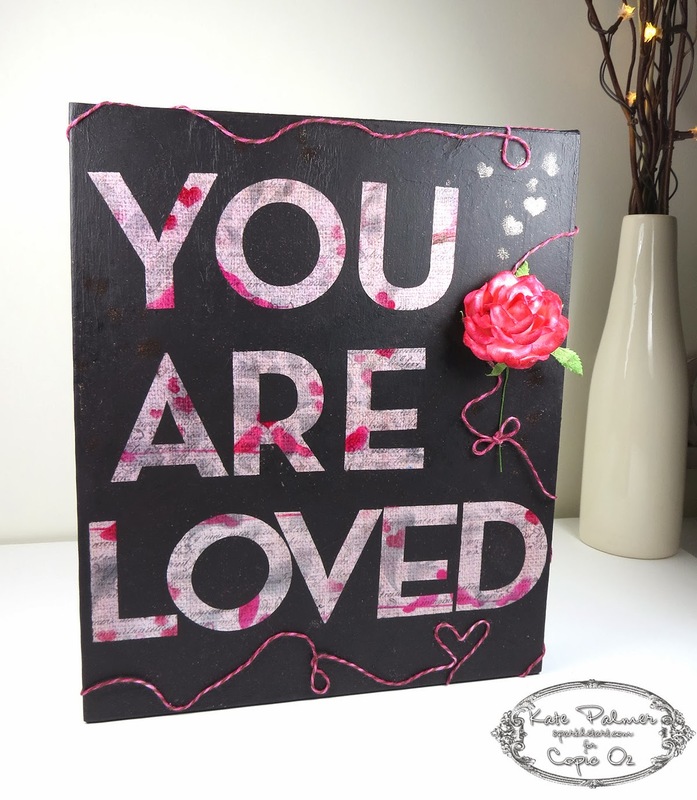 Use Hazel & Ruby Broadside Alphas to create a message, saying or sign, remove letters from plastic backing and adhere to the decorated paper - make sure you have smoothed the letters down well so that paint will not bleed under the stencil masks. 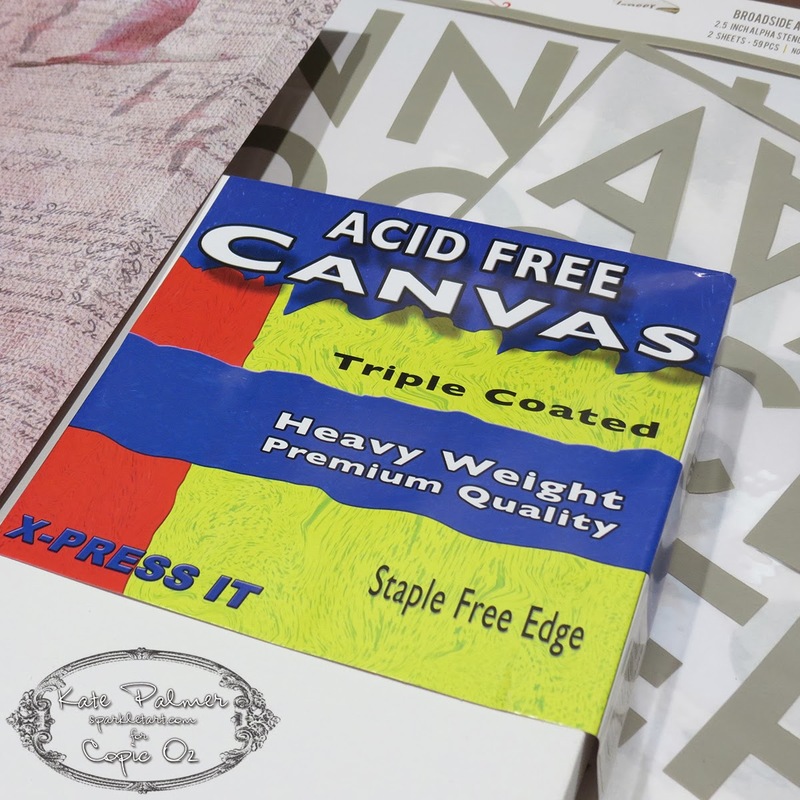 Using a foam brush or stippling brush, coat the entire surface of the canvas with paint. 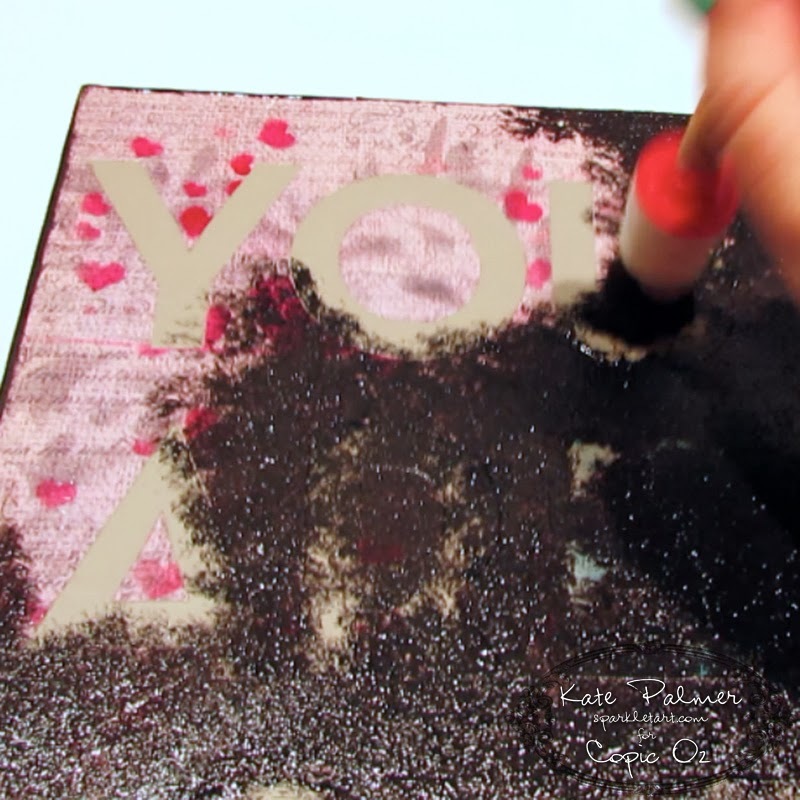 While the paint is still wet carefully remove each letter from the canvas. You will need to use either a pin or some fine tweezers to lift the letters up. 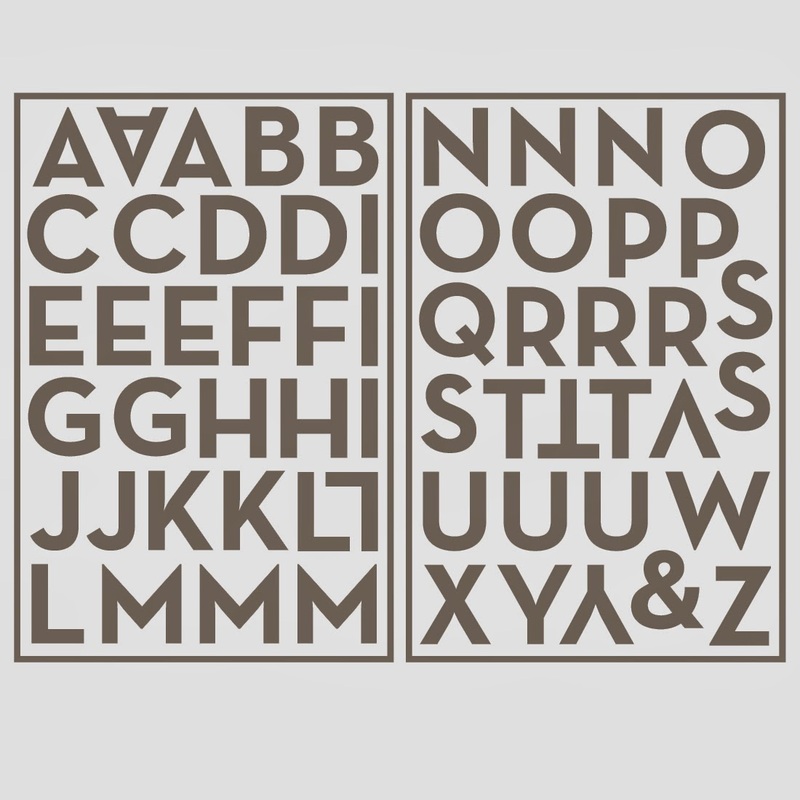 Once the letters are removed, wash letters under warm water to remove the paint and then leave to dry. 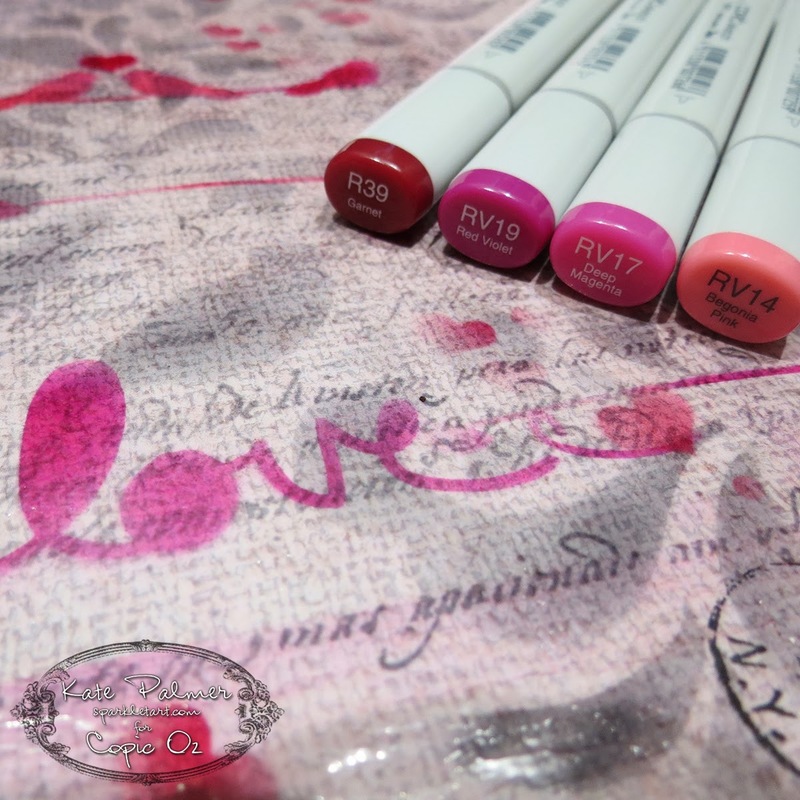 Leave your canvas to dry overnight. 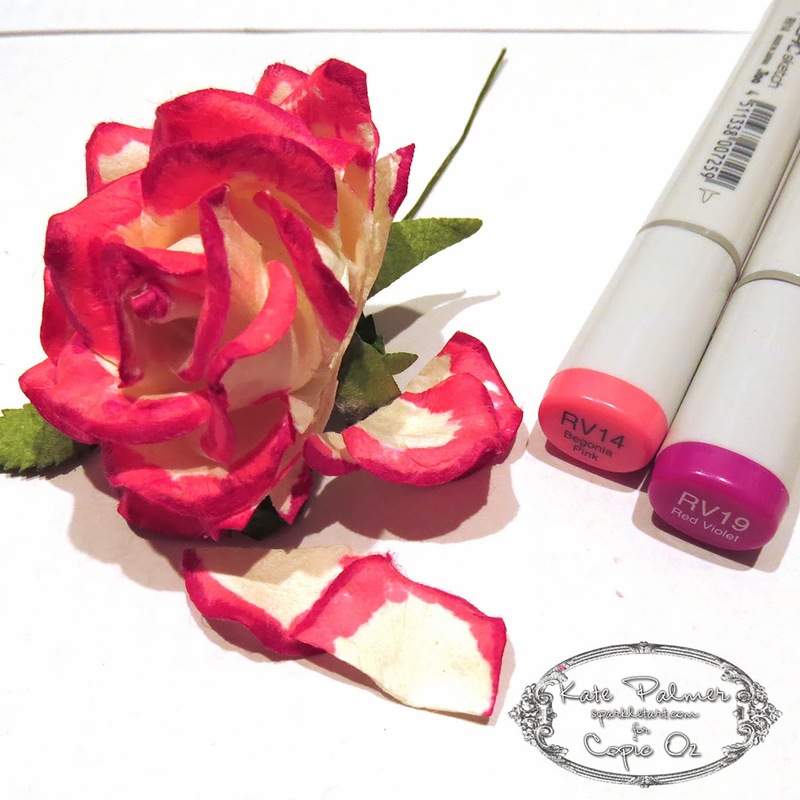 Use the directions on the Copic Oz blog to create a Copic coloured flower to match the colours used on the canvas. I have trimmed off part of the flower so that it will sit flat. Use the same Copic Marker colours to add colour to some twine. 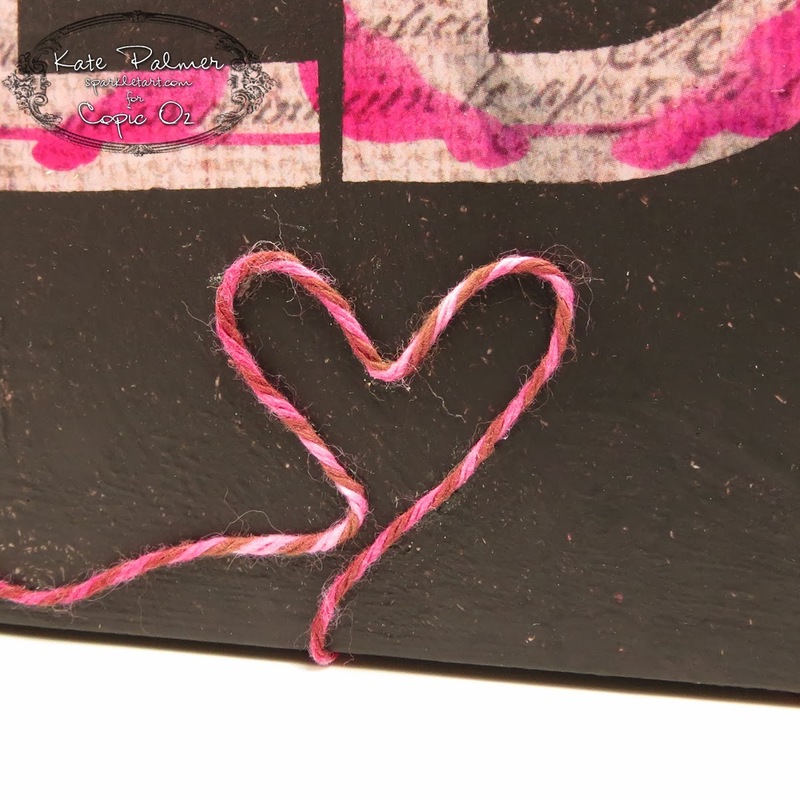 Glue the twine onto the canvas in a random twisting pattern. and this is the finished Subway Art canvas I created. Congrats on the new blog everyone! Wonderful to see a nice refreshing change to bring all your brands under one banner.